The RealZips app enriches your existing CRM data with very deep health care data, making it possible to pinpoint your full market potential. The RealDatasets describing your market opportunity is fully integrated with all your existing CRM data, right inside Salesforce. RealZips makes it possible to focus sales activities in areas with large clusters of physicians, creating as many opportunities to connect as possible. By sharing data such as demographics and treatment data from RealZips, your team can empower health care providers to understand their local market. Search all cities and zip codes. Instantly rank by "Lead Potential". 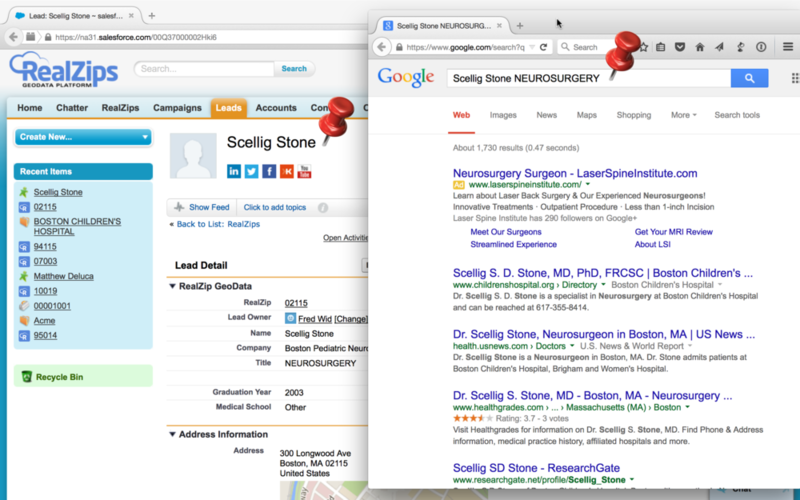 "Leads - Open" shows the number of neurologists. Point on a RealZips for a pop-up window with all key information, including a mini map. Review the full Zip code page with e.g. key metrics and territory information. Real Datasets over medical procedures, hospitals and physician's offices on a zip code level. Get contact data for 900,000 physicians, across 75 specialties and hospital data for 4,800 hospitals. Sample of contact data for a physician, including the NPI number and Practice PAC ID. One-click link to instantly review information about the physician. Hospital record with Provider ID and Hospital type. 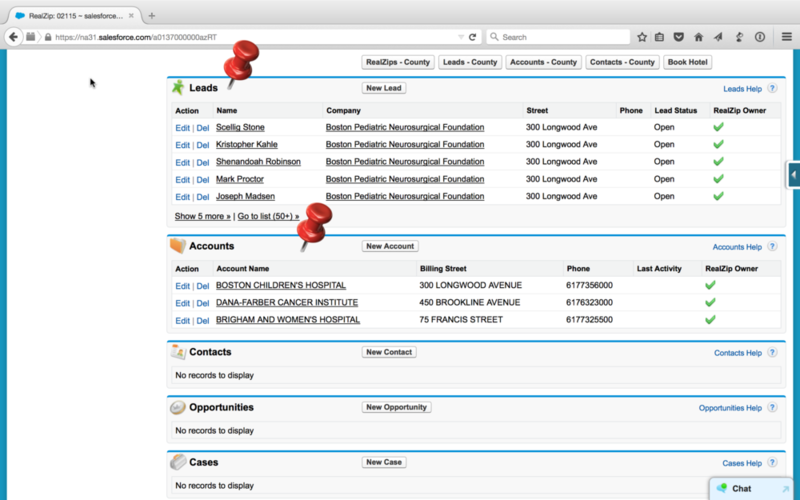 RealZips for Life Sciences comes with 4,800 hospital records. One-click report to review potential (# of neurologists). Areas with green stars have over 20 neurologists. Compare with other datapoints: existing customers, offices, procedures and population. Overview of neurologists across metropolitan areas in Massachussets. Overview of neurologists across the US - "Leads Open". RealZips makes it possible to combine critical datapoints, to understand your market potential across states, sales territories and cities. It is now possible to make instant decisions based on data such as population, medical procedures, address data of hospitals and doctors, sales activities and sales progress.